The palace complex operates from 9 am to 6 pm. Opening times can vary depending on the season. The Versailles Palace is open for visiting throughout the year. We are comparing Versailles Palace and Gardens Day Ticket Prices from leading ticket suppliers and Try to find you Cheap tickets prices on the market. 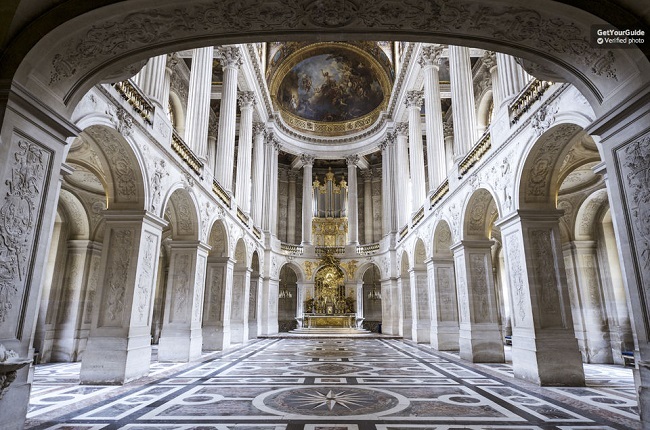 The Palace of Versailles and Gardens Full Access Ticket is a self-guided tour package that entitles you to experience the expansive and incredible royal palace at your own leisure. With this ticket, you can avoid waiting in two long lines (for purchasing tickets and entering the property) and enter the Versailles Palace directly. With the accompanying audio guide, you’ll gain a greater insight into the artworks decorating the grand halls and private rooms. You’ll have the chance to learn how the royals and the aristocracy spent their time in the Versailles. Outside, you can enjoy strolling in breath-taking gardens, secret groves and watch the performances of magnificent fountains. This tour is ideal for everyone who would like to spend an entire day in a splendour of the royal palace and its gardens. Devotees of art, Roman/Greek mythology and horticulture will be particularly delighted. Your Experience With Versailles Palace and Gardens Day Ticket? You will visit the royal complex of Versailles, which consists of the Versailles Palace, Versailles Gardens, Great (Grand) Trianon, the Small (Petit) Trianon and the Queen's Hamlet. Benefit from fast-track entry to the Versailles Palace, avoiding long lines by pre-purchasing your ticket. Walking between private room, huge halls and spectacular reception rooms of the royal palace, you dip into the wealth and luxury of the former royal residence. While getting around the palace's premises, listen to your live guide or audio guide and learn the most important facts about the palace. Head outside to the Versailles Gardens and walk along paths lined with lush vegetation, colourful flowers, majestic statues and flowing fountains. Since this is the self-guided tour with the audio guide, you have the freedom to organize your visit for a time which is convenient to you. What Versailles Palace and Gardens Day Ticket Includes? Skip the line entry to the Versailles Palace and Gardens Complex. A self-guide tour of all the Palace’s public facilities including the palace, gardens, and the bedroom living quarters of Trianon’s and Marie-Antoinette's. Audio guides are available in several languages including English, French, Spanish, Japanese, Chinese and Italian. There is so much to see and do at the Versailles, so allow as much time as possible for a visit. Bring enough water when you visit the Versailles complex. Travelers Reviews about Versailles Palace and Gardens Day Ticket? The general opinion of travellers about the visit to the Versailles Palace is generally very positive. According to leading travel platforms the skip the line visit to the palace has a 4.4-star rating on Get Your Guide and 4.5 from TripAdvisor and Viator users. A visit to the royal complex was the highlight of the holiday for many travellers. Many of them advise future visitors to allocate a full day for the visit. The Versailles Palace complex is suitable for wheelchair users. Depending on your ticket provider, you may be entitled to a full or partial refund in case of cancellation. All cancellations should be made in advance to avoid additional charges. Vouchers in printed or electronic forms are valid for the visit. With the full access ticket, you avoid queues for purchasing the tickets. There may be a short queue to pass through security checks at the Palace entrance. Check out if the Fountain Show takes place on the day of your visit; if so, you will need to pay a surcharge to see the show. Meeting Point: go directly to the fast-track entrance at the Palace of Versailles, Place d'Armes, Versailles. Duration: The excursion to the battlefields of Normandy lasts around 14 hours.